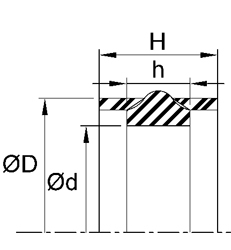 UP Piston Seals are non-symmetrical lip seals of single-acting design. The asymmetrical cross-sectional shape insures that the seal remains steady in the groove preventing tipping or twisting, resulting in excellent sealability and low-drift as well as low breakout force. 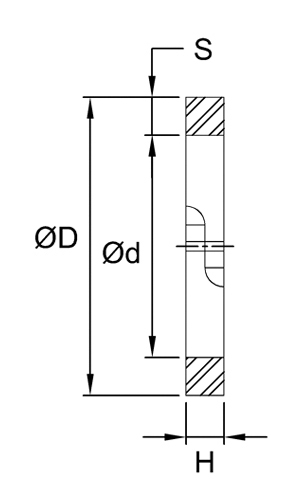 Double acting cylinders require tandem seals in separate grooves. E4 profile is a non-symmetrical piston seal designed to seal both lubricated and non-lubricated air. 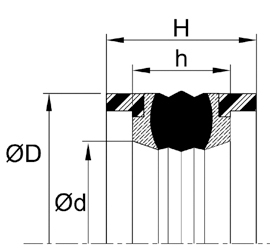 To insure that critical surfaces retain lubrication, the radius edge of the lip is designed to hydroplane over pre-lubricated surfaces in order to provide extreme low friction and excellent wear resistance. CB This double acting piston cup is a single piece unit designed to be fastened directly to the rod. 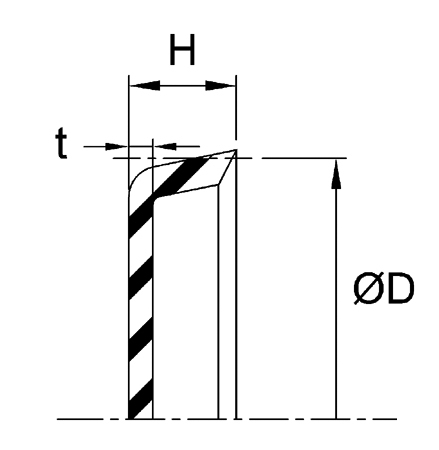 The existing center hole may be enlarged to fit larger diameters. The cup is made of 90 durometer Nitrile vulcanized to the coated steel plate. It is suitable for use in pneumatic and low pressure,light duty hydraulic cylinders. 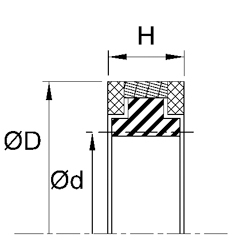 CF fabric-reinforced cups are primarily used on hydraulic piston heads, plungers or rams. Easy to install with simple tooling, low cost and good service life are reasons why these seals are still common in the industry. CH Similar to the CF-series, these homogeneous cups are limited in use to pneumatic or low-pressure hydraulic service. TP Piston T-Seals are designed to retrofit O-Rings in typically no-back-up standard grooves. Their flat base and positively actuated anti-extrusion rings provide improved stability and extrusion resistance. Piston T-Seals eliminate the spiral or twisting failure that can occur when using O-Rings against dynamic surfaces. 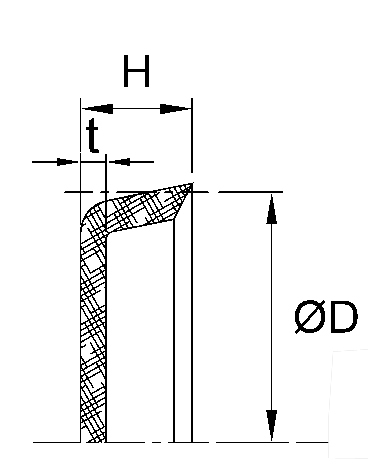 Certain sizes are also available for one and two back-up O-Ring groove designs. 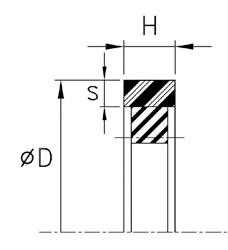 PSP profile is a squeeze-type, bi-directional piston seal for use in light to medium duty hydraulic applications. 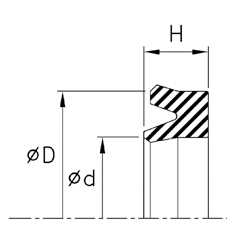 The PSP’s seal geometry provides a fluid reservoir between the two sealing lips which holds system fluid, resulting in lower breakaway and running friction. It is designed to retrofit no-back-up O-Ring type grooves. 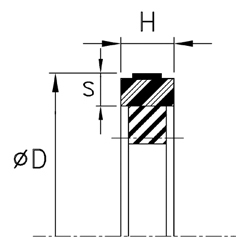 PSP-A-AT Similar in nature to the PSP profile, these series are designed to retrofit one-backup (A) and two-backup (AT) O-Ring type grooves. 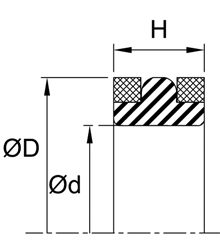 BP profile is a squeeze-type, bi-directional piston seal for use in medium to heavy-duty hydraulic applications. The BP’s standard 60 Shore D outer ring offers exceptional extrusion resistance and extended temperature range. The BP profile is easy to install and will resist rolling and twisting in long stroke applications. 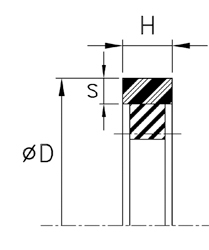 The PIP profile combines a "Pressure Inverting Pedestal" with Type B Polypak to provide excellent, bi-directional piston sealing in hydraulic applications. 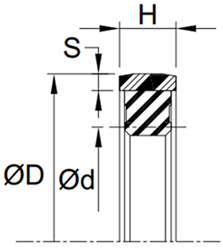 The pressure Inverting Pedestal conforms to the beveled sealing lips of the Type B Polypak to provide extrusion resistance when pressure is applied to the heel of the seal. 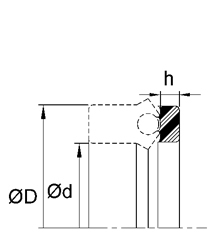 The PIP profile requires only a dingle seal groove for installation. This eliminate the use of two Polypaks on the piston to save space and increase bearing lenght. PIP Rings are auxiliary devices used to convert Type B Polypak seals from single-acting to bi-directional sealing ability. 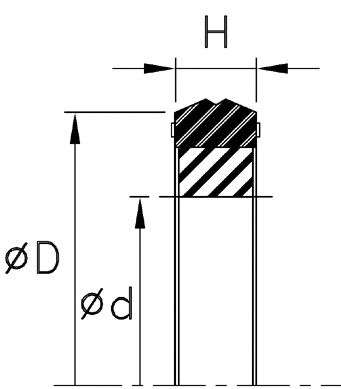 See “PIP Seal” section for complete seal assemblies. 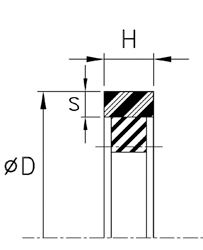 TFES profile is a bi-directional piston seal for use in low to medium duty hydraulic cylinders. 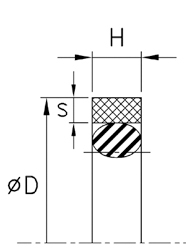 Due to its compact size, it requires minimal gland space on the piston. 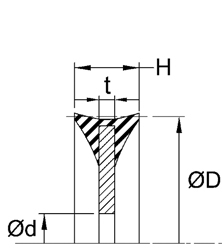 The TFES profile offers both low break-out force and reduced wear. 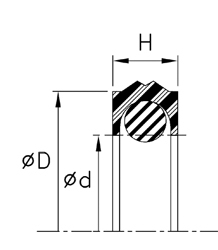 160G profile is a bi-directional piston seal for use in medium-duty hydraulic cylinder applications. Its 2-piece design is comprised of a glass-filled PTFE dynamic element and a square elastomeric expander ring. This seal offers low friction, low-wear and extrusion protection. 169B Similar in design to the 160G, the 169B profile is of a heavier cross-sectional sizing to offer outstanding performance in heavy-duty applications. The bronze-filled PTFE outer ring allows for greatly reduced wear rates resulting in extended durability. 169G Dimensionally identical to the 169B series, the 169G with its high glass fiber content offers you superior extrusion resistance. 169U piston seal is a compact, low friction seal designed for low to medium duty hydraulic applications. It comprises of a tough, polyurethane dynamic sealing element which is pre-loaded by a square section elastomeric ring. CAT TYPE-1 Two-Piece piston seal for Caterpillar®-specific equipment. Part numbers are for reference purposes only, we do not imply that these parts are of original equipment provenance. PS2470 is a compact bi-directional seal designed for medium-duty hydraulic service, the PS2470 seal offers low-friction and good wear resistance. The addition of chamfered edges make it easy to install in the cylinder bore and facilitate resizing during cylinder reassembly. 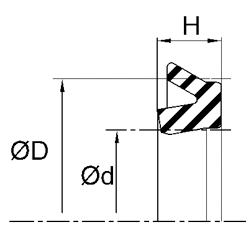 CAT TYPE-3 is similar to the C914 design, this is a two-piece piston seal for Caterpillar®-specific equipment. Part numbers are for reference purposes only, we do not imply that these parts are of original equipment provenance. 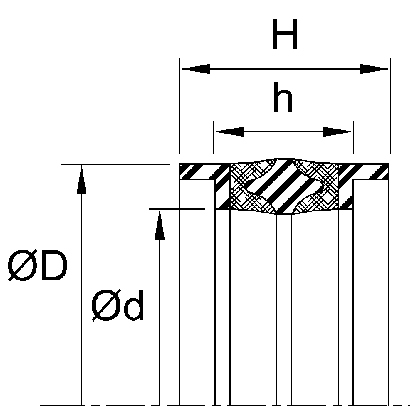 HDP 330 piston seal is a two-part seal set consisting of a stepped-cut thermoset sliding ring with an elastomeric loader ring. The special polyamide ring withstands the most extreme pressures and also allows for rougher cylinder bores, which can reduce production costs. Its stepped-cut design and profiled expander ring make it especially easy to install. CTS profile is a four-piece assembly made up of a rubber energizer, a PTFE cap and two anti-extrusion rings. A low-friction, low wear seal with high extrusion resistance, this seal is an excellent choice for sealing mobile hydraulic applications that experience shock loads. P1000 metallic piston rings are low wear, highly extrusion resistant seals used in hydraulic applications. They are bi-directional in use, and can pass open ports without clipping the joint tips. P1000 HYCO Similar to the standard P1000 design, these are Hyco® brand-specific equipment. Part numbers are for reference purposes only, we do not imply that these parts are of original equipment provenance. 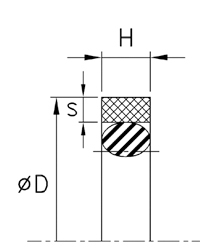 P3C profile is a double-acting piston seal used in combination with "L"-shaped bearing rings to give a very robust heavy duty seal assembly requiring split pistons. It's dual material construction allows low-pressure sealing ability with elastomeric center as well high extrusion resistance with the fabric-reinforced ends. The "L"-shaped bearing rings protect from metal-to-metal contact and insure proper centering of the piston within the cylinder bore. P3D Specifically used for light-duty, one-piece piston applications, the P3D piston seal is an assembly of a continuous rubber ring with two scarf-cut acetal bearing rings. These bearing rings are designed to support the piston assembly and avoid excessive side-loading. P5B seals are designed for easy installation on one-piece pistons. Using a homogeneous center ring for excellent sealability, split nylon rings are added for extrusion resistance as well as split bearing rings for guiding and piston support to avoid side-loading.